Saturday morning we enjoyed a lovely breakfast at Corsewall Lighthouse Hotel before setting out on a very exciting adventure! 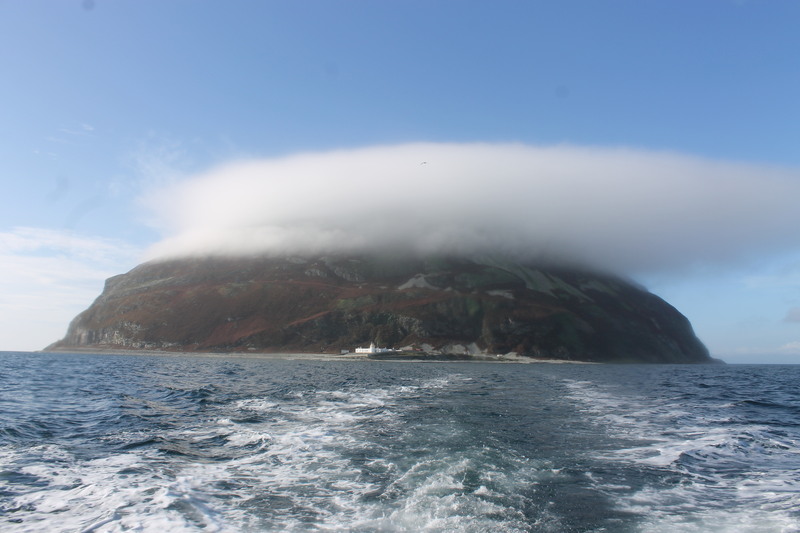 Bob had arranged a boat trip for us out to Ailsa Craig (the ‘lump in the sea’, also known as Paddy’s Milestone, off of the west coast of Scotland). It was a little out of season for the boat trip, but we got the go-ahead and met Mark who runs Ailsa Craig Trips on the M.F.V. Glorious. After we’d thrown our waterproofs on, we set off on a slightly rocky and wet trip across to the island. As we approached the ‘lump’ grew bigger and bigger and became more and more fantastic, although it did have its head in the clouds! We also spotted the lighthouse and, once we’d landed, we headed straight for it. The visit to the lighthouse has to be one of the most memorable I’ve experienced. It was like an unofficial museum and really quite sad. Bob had visited a few years ago, but at that time not been able to get into the lighthouse cottages, but the doors are now open and the insides of the buildings open to the elements. The furniture, previously used by the lightkeepers and miners on the island, is now strewn across each room and abandoned books, jars of food, and tins of paint appear in a number of rooms. The general feeling is of abandonment and it reminds you of those who made a living working there and were made unemployed suddenly when the lighthouse was automated. After leaving the lighthouse and its buildings we wandered around to the south fog horn – reaching the fog horn on the north of the island involves walking a rather dangerous path (which Bob did when he last visited, of course)! I’d never had the chance to see inside a fog horn structure before, but you could walk into this one and see the various air pipes linked up to the compressors a short distance away. On our stroll back to the boat we were delighted to see the sun coming out while we enjoyed the amazing geology of the island and explored some more of the derelict buildings. It got even better though as Mark agreed to take us around the whole island in the boat and, as we pulled away from the island some seals popped up to say hello. I’ve never seen anything like the amazing geology Ailsa Craig boasts, it was absolutely stunning and the sun stayed out to offer us the best lighting it could! The journey back to Girvan wasn’t quite so rocky as the outward journey and we made it back safely onto dry land. Before heading back to the hotel we paid a visit to Turnberry lighthouse, which I’d not seen close up before. We had to be a little aware of flying golf balls on the way as access is only possible through the world-renowned golf course. It’s a beautiful lighthouse though and so lovely to have a wander around the grounds. On the way back, Bob spotted signs for a Russian memorial near Lendalfoot and so we turned off to find out more. The memorial to the lost Russian warship, Varyag, was unveiled in 2006, over 80 years after the ship was wrecked off of the Ayrshire coast. Once back at the hotel we enjoyed another five-course dinner before retiring to our amazing suite! On Sunday we sadly left Corsewall Lighthouse Hotel and drove east for a brief visit to Southerness lighthouse. Although the weather wasn’t great there was still an air of holiday about the place with a few families around. The lighthouse there is quite an interesting one due to its shape. I can’t really describe it, so you’ll just have to see the picture on the right! It’s a really nice place with a good feel about it. 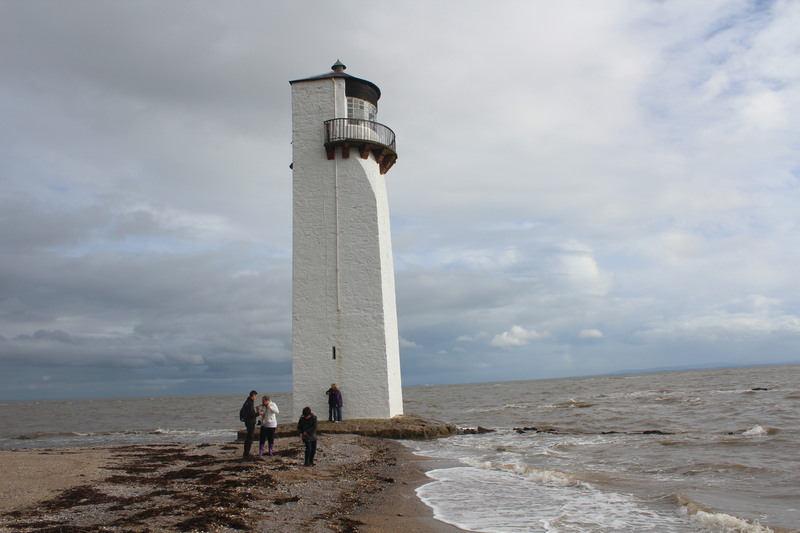 I think by walking to the lighthouse, we encouraged others to do the same and then got annoyed that people wouldn’t move away and out of our pictures! Our destination for the night was The Lovat hotel in Fort Augustus, so we had a bit of a travel day, which was fine as the weather wasn’t too good. This was, however, broken up by our first visit to a garden centre together. We’ve had an on-going joke that we won’t go to the cinema or to a garden centre until we are married and no longer do fun things. We’ve still not made it to a cinema, but I was actually quite excited to pay a visit to the garden centre. It helped that we had some lovely soup and a piece of cake too! Upon reaching The Lovat I was so happy to see our room, including the swan towels on the bed, a half bottle of champagne and a TV in the bathroom (we didn’t use it though)! We had a wonderful meal, starting with haggis bon bons (amazing!) and a cocktail followed by plenty of food. Monday was the final day of our fantastic honeymoon, with our destination being home. Before we left Fort Augustus we wandered along the road to Loch Ness to see the old pepperpot lighthouse which is still in operation. There were some amazing views across the loch, but no sign of Nessie unfortunately. On our way up the road we stopped off to see the old Bona lighthouse building at the north end of Loch Ness. It’s looking very abandoned and, although there have been plans to renovate it into a visitors centre, there has been a lot of resistance from the local community. It’s always a shame to see a lighthouse fall into disrepair. 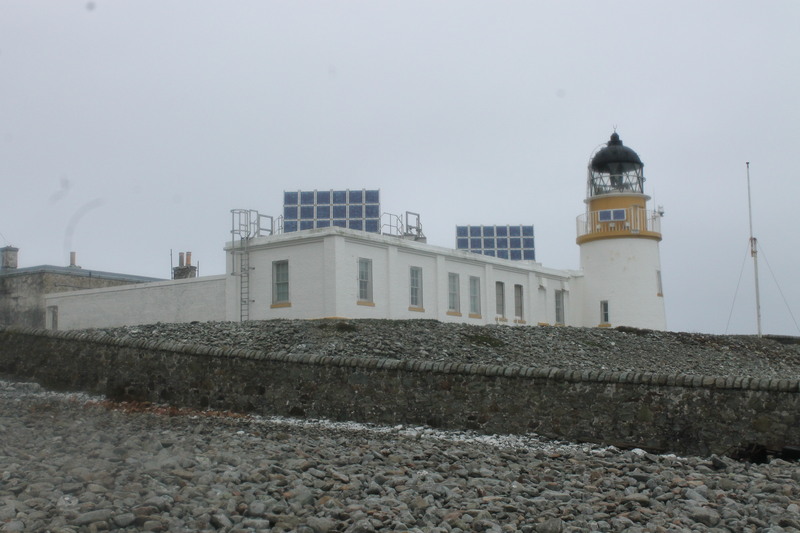 Further north we stopped at Tarbat Ness lighthouse which I was able to see properly this time! When I visited during my month-long tour last year it was so foggy that when I parked up I could barely see the lighthouse. Luckily it was a lovely day and I got the full effect of this beautiful, tall, red and white striped structure. A fantastic lighthouse to end on. 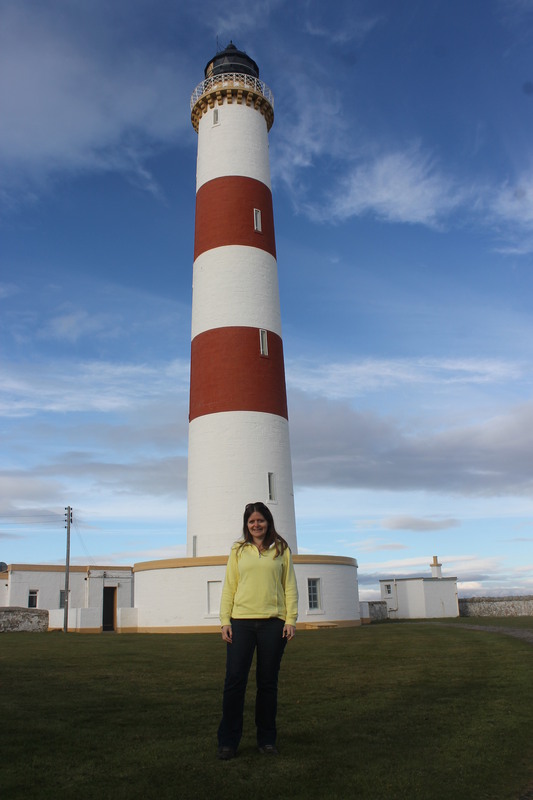 In total we visited 26 lighthouses between day 1 when we left St Catherine’s and day 10 at Tarbat Ness.